Safe, secure and guaranteed document destruction using a heavy duty paper shredder at highly-competitive prices – up to 12,000 pounds per hour! 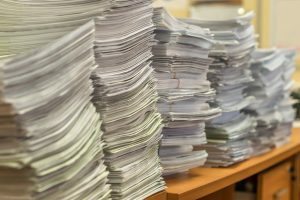 Even if you store most of your data electronically, you’d be surprised at how much information you still have on paper — old pay stubs, tax returns, client notes, customer invoices and more – all could contain potentially harmful information that could be detrimental to you, your employees, and your customers. Our heavy duty paper shredder can provide peace-of-mind and security by physically reducing paper documents to shreds of paper impossible to reconstruct. Many industries, such as banking and health care, have strict state and federal regulations dictating how they must handle sensitive information. These laws are designed to protect personal information and carry stiff penalties for organizations that fail to comply and put individuals’ personal information at risk. A Certificate of Destruction is given to you after each service, so that you can document compliance with state and federal laws. A heavy duty paper shredder is the ideal solution for ensuring that any sensitive information that has outlived its need is irretrievably destroyed. The data destruction experts here at Data Destruction Services are professionally trained and highly skilled at effectively destroying sensitive documents in many forms. Instead of attempting to destroy documents yourself using an inefficient retail paper shredder that wastes valuable employee time and company resources, let us come to you with our industrial-grade, heavy duty paper shredder and do the job quickly and efficiently. Contact us today to learn more about the services of our heavy duty paper shredder.